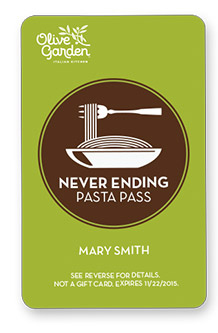 Olive Garden’s Never Ending Pasta Passes go on sale today, Thursday, September 17th by clicking here at 2:00 pm ET. Only 1,000 of each pass will be sold! The Pasta Pass allows Passholder to enjoy the Never Ending Pasta Bowl promotion at Olive Garden as many times as they wish (in-restaurant) for 7 weeks. That’s right – unlimited food at Olive Garden for 7 weeks. Passholders can also redeem their Pass twice per day ToGo. Passholders and their guests also receive complimentary Coca-Cola® soft drinks. This year we have 2 types of Pasta Passes – the Individual Pass and the Family Pass. 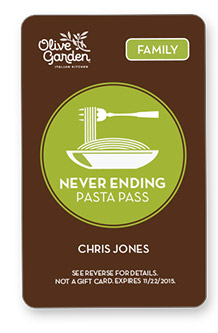 The Never Ending Pasta Bowl Promotion (and Pasta Pass redemption period) is October 5-November 22, 2015. You have two different types of Pasta Passes – what’s the difference between the Individual Pass and the Family Pass? soft drinks for Passholder & guests. Coca-Cola® soft drinks for Passholder & guests. How much does the Pasta Pass Cost? • Sales tax will not be applicable for Never Ending Pasta Bowl items & and soft drinks covered by the Pasta Pass. Only standard shipping (2-7 business days) is available. All passes purchased on Sept. 17 will be received prior to the Oct. 5 launch of the Never Ending Pasta Bowl promotion. Can I order Never Ending Pasta Bowl ToGo and use my Pasta Pass? You may redeem your Pasta Pass ToGo twice per day. Individual Pasta Pass Passholders will receive 1 dinner portion with breadsticks and soup or salad. A dinner portion is a pasta/sauce combination and a single serving of the topping of your choice. Family Pass Passholders can receive up to 4 dinner portions per redemption, with breadsticks and soup or salad. Refills are not available ToGo, but you are welcome to never ending refills during dine-in visits. Both cards receive 1 complimentary soft drink per Pasta Pass ToGo portion. Is there an age restriction for purchase of the Pasta Pass? I want to purchase a Pasta Pass for someone else – can I do that? Yes – use the name and shipping address of the recipient, but use your name and billing address for payment. Can I share the Pasta Pass with a friend or family member? The Pasta Pass is intended for use by the Passholder whose name appears on the printed Pasta Pass. Pasta Passes are personalized and non-transferable. If you have an Individual Pass, the pass is intended for your use only. If you have a Family Pass, you may bring up to 3 guests with you when you redeem your Pass. Do I need to show an ID to use the Pasta Pass? We reserve the right to ask for identification when redeeming the Pasta Pass. Does my Pasta Pass cover other beverages (coffee, iced tea, alcoholic-beverages, etc.)? In addition to Coca-Cola® soft drinks, you may enjoy unflavored iced tea with your Pasta Pass. Other beverages (Bellini Peach-Raspberry Iced, Raspberry Lemonade, Limonatas, Coffee, etc.) are not included. No, gratuity is not included – but is always appreciated. Can I use my pass at Canada or Puerto Rico Olive Garden locations? The Pasta Pass is valid only at US locations, excluding Puerto Rico. Is the Pasta Pass valid for gluten-free pasta? Yes – our Gluten-Free Rotini is in the Never Ending Pasta Bowl lineup. Combine with Traditional Meat Sauce and Italian Sausage for a complete meal without gluten-containing ingredients. I have a different question that is not addressed here. Who should I ask? We welcome your questions. Please call us Monday-Friday 10am-4pm at (844) 209-3484 or engage with us on social media via Facebook or Twitter.